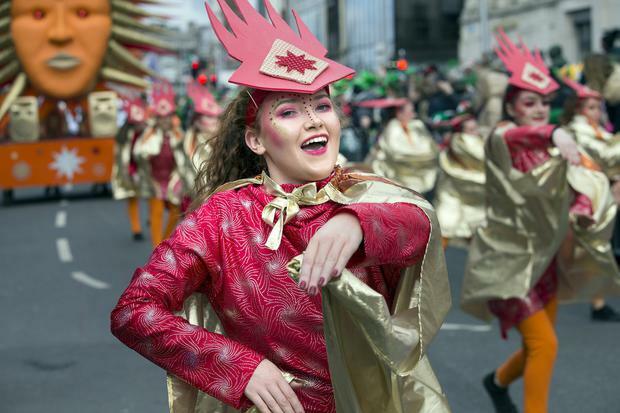 Some 500,000 people enjoyed Dublin's St Patrick's Day parade as organisers splashed out €1.9m celebrating the capital's five-day festival. 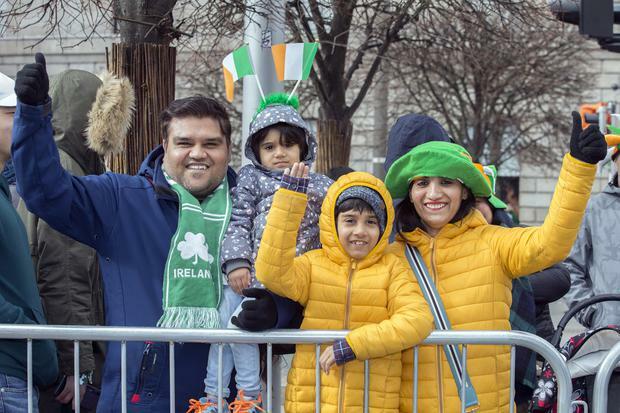 Families from across the globe turned out to the largest parade in the country as the sun shone on O'Connell Street in the heart of the city. And as the event marked Ireland's rich history of storytelling, the old and new Irish told their own stories and the value they place on Ireland's national holiday. A family beginning a new story in Dublin, the Chhikaras from New Delhi, India, marvelled at the party atmosphere. Father Arun Chhikara (34), wife Anjali (34) and children Kanishihk (7) and Kiara (3) have recently moved from their homeland to Clarehall in the north of the city. "I moved to Ireland to work as a project manager but that's not the main reason we moved here," Mr Chhikara said. "I wanted to bring my children to Ireland, as it's a country with clean air and water and with a friendly people and rich culture." He added that attending the parade was "another part of us learning about Ireland's culture". 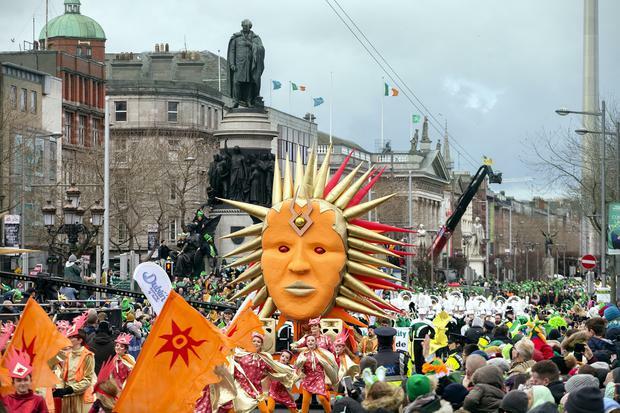 Susan Kirby, St Patrick's Festival chief executive, said the €1.9m investment leads to a huge boost to the Dublin economy as tourists flock to events throughout the week. President Michael D Higgins watched with wife Sabina after attending Mass at the Pro Cathedral. Mr Higgins told RTÉ how Ireland was "opening our hearts" to immigrants and welcoming those from foreign lands to "be Irish with us". He added the Irish had an "inclusive and caring nature." Ms Higgins also said: "Ireland is giving a present of love to the world when it so needs it." The parade marked a special family event for Dubliners Michelle Green (32), husband Terry (39), and children Sean Anthony (11), Sienna (7), and Louis (5). The family from Donabate, north Dublin, were enjoying the parade as a treat which is especially vital for Louis, who has Worster-Drought syndrome, a form of cerebral palsy. "This is a big deal for us," Ms Green said. "We've never been to the Dublin city parade. We always went to our local one but we made an extra effort to come today for the kids." Jill Behnke (36), husband Bob (38), daughter Ryleigh Barratt (18) and son Colton (2) had only just arrived in Dublin at 4am after a flight from Chicago but despite getting no sleep, the family hit the streets for the parade. "We've been up for 24 hours," Ms Behnke said. "But we're running on adrenaline and having a great time." Comedians Jason Byrne and Deirdre O'Kane, the parade's grand marshals, were in fine spirits despite the long day ahead of them. After leading parade festivities, they were due to take to the stage for the Paddy's Night in Support of Comic Relief at the 3Arena in Dublin. 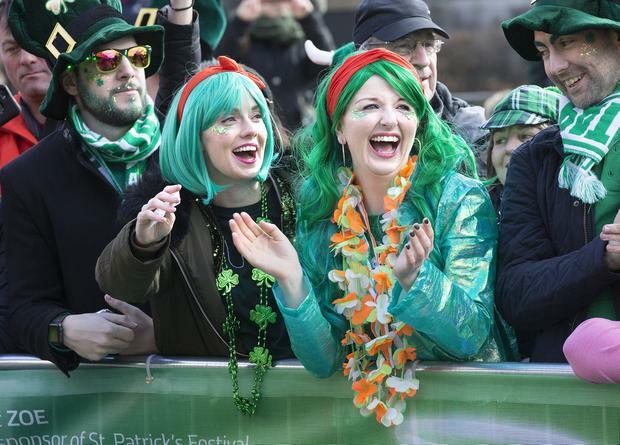 Though the forecasters had predicted a cold, wet and windy day, the sunshine saw crowds basking in a party atmosphere with an array of floats from across the world.